Many people appreciate the convenience of rain boots. This useful and effective footwear is designed to keep your feet dry above everything else. 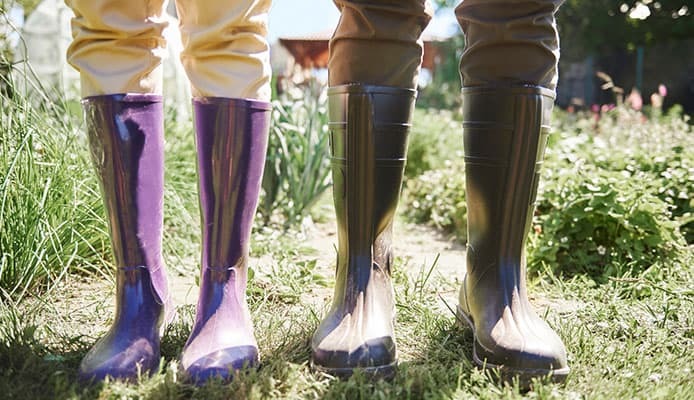 No matter if you live in an area with a lot of rainfall, or you want a sturdy pair for outdoor work, you can certainly benefit from additional feet protection. However, not all people want and expect the same things from their rain boots – some need stylish footwear which they will put on a couple of times a month, while others need something tough to wear every day. For this reason, you will come across different types and styles. 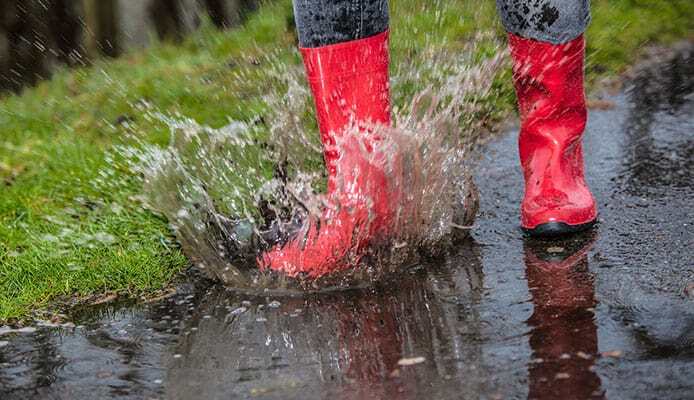 Finding the best rain boots comes down to carefully considering what you need, and our buying guide will help you do that. In addition, we handpicked some fantastic products for you to choose from is you need something tested and reliable, so don’t miss out. We start off with a great pair of boots from Bogs. They are fully waterproof and and made of durable, hand-lasted rubber. With these boots you can count on comfort too, because they have a contoured EVA footbed. It’s shaped like an arch to properly support the sole of your foot. The lining has the ability to wick sweat so your feet remain dry. Furthermore, the manufacturer uses DuraFresh biotechnology which fights odors and eliminates the unpleasant smell, which is a big problem for those who spend a lot of time in their boots. You will have no trouble putting them on since the opening measures 14.5 inches. In addition to things we mentioned, this product comes with 7mm neo-tech insulation. This makes them very versatile and a great pick for cold weather. 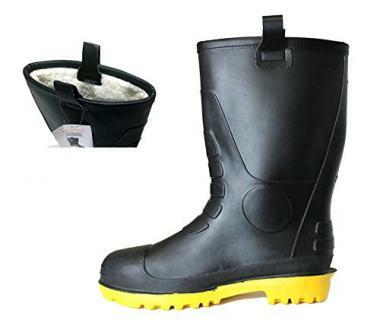 You can easily use them as ice fishing boots, since they are tested to be warm even in temperatures of -40°F. The tread is well-designed, and creates a good grip. It is also very easy to clean, and you don’t have to worry about leaving any marks on indoor surfaces. You can get these boots in many sizes (both very small and large), and you have a choice between a fully black boot or a model with mossy oak pattern. Because of the high quality, attention to detail and overall comfort, these are probably the best boots for rain you can find and you won’t regret buying them. 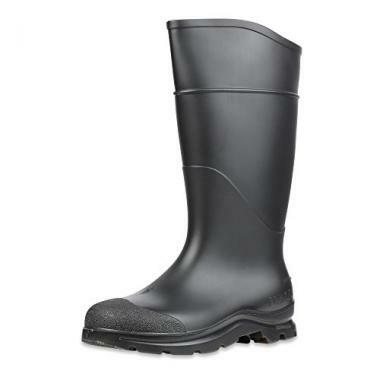 This boot from CLC is designed for heavy-duty use. You can put them to work right away, no matter which activity you have in mind. The PVC material gives your feet excellent protection (not just from rain or water). The material is also exceptionally durable and resistant to wear. One of the reasons for this is the specially designed scalloped top line, which gives added reinforcement in an area where the boot flexes most. It also reduces irritation to your feet and makes walking more comfortable. These feature EVA foam footbed to further increase comfort when you have them on for a longer time. The grip on slippery surfaces is very good, thanks to the cleated sole designed to improve traction. These boots are 15 inches tall, and the legs of your jeans will easily fit inside. You have sizes 7 to 14 available, and the manufacturer used “over-the-sock” sizing. This means you can get your standard size and still have enough room to wear a pair of socks without them being too tight. Finally, this product comes at a really good price and won’t put a big load on your budget. 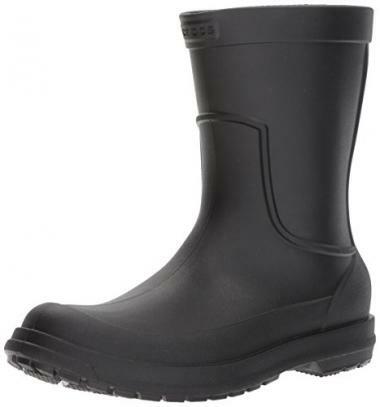 In addition to protection from rain and water, the Servus men’s boots give you extra protection if you need it. 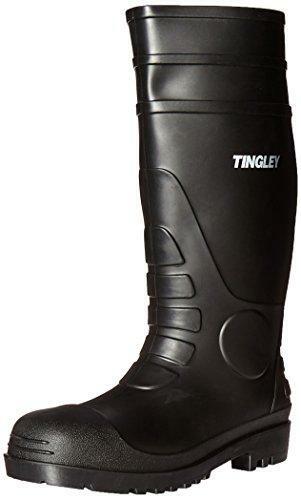 Besides the regular soft toe which comes with most boots, you can get these with steel toe so it protects your toes from unfortunate accidents. You can also get them in black or yellow. They are made of PVC poly blend which is injection molded and seamless, which eliminates possible leaking points. Furthermore, you will see that it is reinforced at stress points to increase durability. The material is resistant to damage from chemicals too. The shaft measures 14 inches, and there is a guide along it if you want to customize height and make them lower. On the inside, you will find a foot-form cushion insole which gives good support and feels nice and soft. When it gets dirty you can remove and wash it, or replace it with a new one. As for the outsole, it has deep cleats and gives you good stability. In addition, it is designed to help save you from electric hazards. These water resistant boots are very easy to put on and take off, and when you’re done using them they are very easy to wash.
Crocs products are well known for their comfort, and these boots are no exception. Fully made of synthetics, they are somewhat lower than other products (shaft measures 10 inches from the arch). The boot opening has a circumference of 15.5 inches, so your foot should be able to get in nicely. There is also a finger hole in the rear, so you can pull the boot on easier. They are fully molded, and won’t let a drop of water get inside. They come in all the regular sizes so you will easily find the right fit. However, you can only buy them in black. Unlike other rain boots, these are very soft under your foot. They can be used for longer walks too, even for hiking in combination with a pair of rain pants for hiking. If comfort is the most important thing for you, these rain boots for men are an obvious choice. This is a very interesting boot that looks a bit different, combining a black upper with a yellow outsole. It’s made of rubber and fully waterproof. It measures 14 inches in height, and you will find pull-on loops on both sides to help you get them on. The outsole creates good traction thanks to many biting edges. Your feet won’t slip even on oil or ice, so you can wear them instead of your regular non-slip shoes when you want added water protection. This product is an excellent choice for winter too, because it contains heat-reflective microfiber lining on the inside. 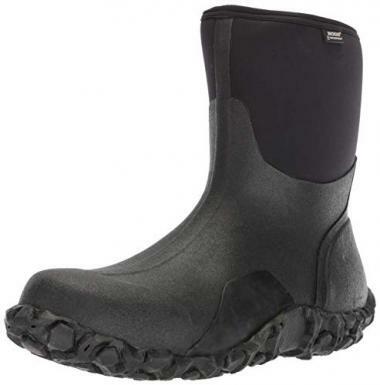 Users say that these top rated boots for rain run true to size, so you won’t have problems in that department. However, if the insulation is not enough and you want to wear socks, consider going with a larger pair so they don’t feel too tight. These boots are another great and affordable solution for cold weather. Thanks to the faux fur lining, your feet will stay warm even in very cold conditions. It goes without saying they are waterproof too, thanks to the strong PVC body. The outsole is rugged and prevents slips, and the whole boot is very long-lasting. They are true to size, and you can wear them over socks and have a tight fit. They are 14 inches tall, and you won’t have any problems putting them on thanks to the finger loops on top. You can get them in sizes 6 to 13, and you can choose between black and yellow color. If you’re looking to get an excellent product and save money along the way, these are the most affordable boots we featured in our rain boots reviews. At 15 inches, they are a bit taller than other products. They are injection-molded, and the material is very flexible so it doesn’t get damaged easily. What’s interesting is that 30% of these boots is recycled material, meaning they are eco-friendly too. You can use them for rain protection, but also for heavy duty work (agriculture, construction or industry). This is possible because the outsole is tough and very resistant to abrasion and the whole boot resists chemical damage well. Considering how strong they are, these are surprisingly lightweight. This is certainly a plus since it makes walking easier. Users say that these tend to run a bit large and wide, so you should keep that in mind when buying. Of course, this can be an upside if you plan on wearing them with thick socks underneath. This is a high-quality product focusing on functionality. It’s made of three types of rubber, so you can get the best result possible. The outsole is made of tough and sturdy rubber to resist wear and abrasion. The Gel-flex midsole is designed to absorb shock when walking and make the boot more comfortable. Finally, the upper is made from soft rubber so it doesn’t interfere with foot movement. In addition, there is a soft insole inside which can be removed or replaced when you need. These have a 1.5 heel, and measure 14.5 inches in height from the arch. In combination with the fact that they won’t let a drop of water in, they can be a great substitute for fishing shoes too. The boot opening is wide so you can get them on and tuck your pants in. You can expect this product to be true to size, and generally have a nice fit on your foot even when you decide to wear socks. It’s a really good boot which is made to last, and definitely worth the money. Your new pair of boots needs to meet some expectations, because unlike many other different types of footwear, these have a specific purpose. First and foremost, no water should be able to penetrate the boot and make your feet wet. In addition to this, wet surfaces are often slippery so it’s a big plus if the boots give you a good grip and prevent slipping. They also need to be easy to put on and comfortable to wear, which is not always the case. Take a look at some of the most important features that make a good rain boot. This is probably the most important thing when discussing rain boots, and the reason you buy them in the first place. The construction must be solid and impenetrable, and because of this many waterproof rain boots are molded as a single piece. They need to avoid weak seams, which are a problem when trying to keep water out. It’s also very important that the rubber or PVC used to make the boots doesn’t crack easily, because the boot loses its function. Try to find products which are made of high quality materials, and don’t forget to regularly take care of your boots. Besides materials, boot design also determines the level of protection you’re going to get. 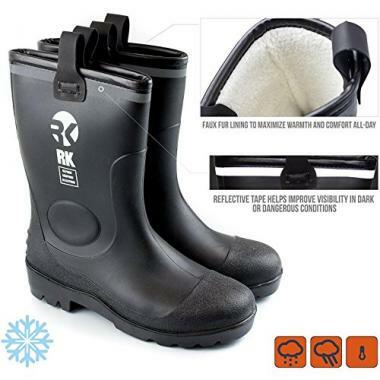 If you’re going to walk in deeper water or expect to be in wet conditions all day, then you should consider a pair that reaches your knees when you put them on, and fits tightly around your calves so that rain doesn’t come in from the top. On the other hand, lower boots are perhaps more convenient, and they will keep your feet dry when going to the store or commuting to work. Of course, don’t forget to put on your waterproof jacket and bring an umbrella. Depending on circumstances, this feature is more or less important when buying rain boots. Traction is their ability to create a solid grip on the surface when you walk, so you have safe footing. In order to do this, boots need to have a well-designed outsole pattern so it creates traction in every direction. While casual rain boots work well with standard outsoles, you need to pay more attention if you plan on using your boots for work too. In this case, they need to have a rugged tread with deep lugs to create a solid grip regardless of the surface you’re walking on – mud, snow, ice, wet grass or any other. In addition to this, it’s a big plus if tread design allows the dirt and debris to fall out on its own instead of getting stuck (because this can make the boot slippery). The pattern isn’t the only thing that determines traction – it also has to do with the type of rubber used. Some materials naturally provide a better grip, and for this reason many manufacturers use different type of rubber for the outsole, opposed to the rest of the boot. For the boots to last, the material used needs to be flexible and able to follow the movement of your foot. Cracks are a common problem for rubber boots, and it happens most often in the area above your ankle. This part is exposed to the biggest stress because of the way your foot flexes when you walk. Another weak point may be the outsole and upper connection on glued boots, especially if the glue used isn’t strong enough. The point of discussing this is that you should look at the overall quality and even read some user experiences so you can know what to expect. Furthermore, the boots should be resistant to various chemicals they come in contact with, especially if you work in them. You’ll find many types of conditioners on the market, which are very useful for treating the boot surface after cleaning them. This decreases the chance of boot getting damaged. Durability also depends on the type and frequency of use, but you can expect the best boots for rain to last for many years as long as you take proper care of them. People sometimes avoid wearing rain boots because there is a general opinion they are not stylish enough. While this was probably true in the past, nowadays you can find numerous interesting and colorful designs which you can easily match with your outfit. Even though they don’t look like your typical pair of shoes, it doesn’t mean they shouldn’t be nice. When it comes to this, you should note that short rain boots are often more stylish than high rain boots. They offer you a larger choice when buying, mainly because they are made to be worn more casually. Bottom line, it all comes down to taking your time and finding the right pair. Finding the proper fit for rain boots is a bit different compared to other shoes. They are more rigid and often cover a good part of your calf. It’s important that you can put the boot on and take it off without trouble, meaning the opening is wide enough to allow you to do this. A boot that is too tight can make walking difficult, while a boot that is too wide will allow water to get in and generally feel awkward (and there is no way to tighten them). Luckily, most manufacturers specify the circumference of the boot opening on the product page. This allows you to take a measuring tape and measure the circumference of your calves, so you can compare. Don’t forget that it needs to have a bit of extra space, so you won’t have to tug them on. Also, rain boots should be worn over the pants (pant legs tucked into them), so keep this in mind too. Furthermore, fit is closely related to size. You should decide whether you want to wear them with thick socks, or without any socks at all – this will determine the size you need to get. Unfortunately, there are no half-sizes for most products, so you will have to go up or down a size. A larger size will accommodate warm socks, but may be too loose when worn in the summer. It’s good when your foot has a little extra room inside, but the boot shouldn’t move independently (which happens with this type of footwear). As for comfort, it depends on the particular product you get. While rain boots are not known for their fantastic feel on your feet, some of them are quite nice. Some models have arched footbed and soft foam insoles which greatly improve comfort. However, keep in mind that it will usually take some time to break-in the boots. Keeping your feet warm is (in some situations) as important as keeping them dry. Additional insulation in your boots will keep your feet warm in freezing temperatures, so it’s an obvious plus if you use them in snowy and cold conditions. However, this becomes a problem during warmer months, because they will feel too warm and make your feet sweaty. There are some models with removable insulation, which seems to kill two birds with one stone and gives the boots better versatility throughout the year. Still, removing the insulation will create extra space inside and leave them a bit too large. You can always buy boots without insulation, and then wear wool or waterproof socks during the winter. The choice you make should be based on the area you live in, and which type is going to be convenient and easier for you to use. 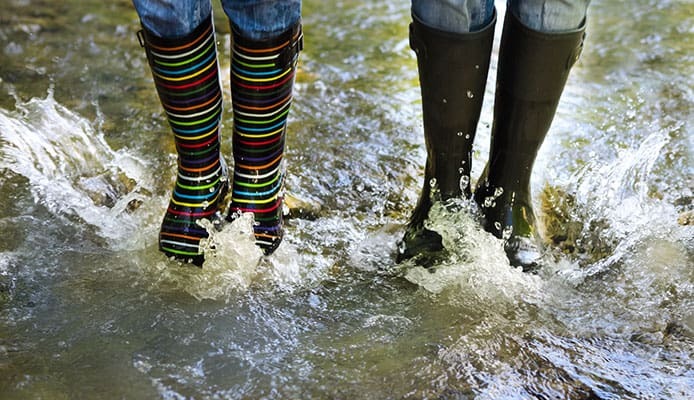 All rain boots are easy to clean, and this is a great advantage compared to many other shoe types. The material allows you to simply wash off the mud and debris with a hose or under a tap. You are allowed to use mild detergents too, if you have some stains that need to be removed. Like we mentioned earlier, it’s a big plus if the outsole doesn’t collect everything you walk over and is easy to clean – it will save you a lot of time and energy. Q: What Are Rain Boots Best Used For? A: Rain boots are versatile and can have many uses. Some people wear them casually when talking a walk or running errands around town. Some models are also great as footwear for work, because in addition to being waterproof they are exceptionally strong and durable. You can use them around your yard, in the garden, for agriculture or any other situation you see fit. Like we discussed, their main benefits are keeping your feet dry and warm. However, rain boots aren’t the best choice for walking in (especially longer distances), because they are too stiff. If you need footwear for walking and hiking, you should take a look at our selection of hiking boots. And if you’re worried about your feet getting wet, you should also consider getting a pair of hiking gaiters. Q: Are Rain Boots 100% Waterproof? A: Yes, they are (or at least they should be if they are well made), which is an advantage over regular shoes. Manufacturers use materials such as rubber, PVC and other synthetic materials in order to keep the water out. As we said earlier, the seals should be glued well or, even better, the boot should be made as a single piece. Additionally, it shouldn’t be prone to cracks. If you wan’t to learn more about what being waterproof really means, we recommend you read our article about the differences between water-resistant vs. waterproof. Q: How To Clean Rain Boots? A: Like we mentioned, it’s really easy to clean a pair of rain boots. You should use clean water and a soft sponge or cloth. If you choose to use a detergent, make sure it’s mild so it doesn’t damage the boot surface. You should rinse off all the dirt before soaping, and then wash off the soap completely after scrubbing. Afterwards, it’s best that you leave them to air dry. When they are completely dry, you should apply the conditioner (if you’re using one) and polish the boots. Conditioning them restores the shine, removes bloom and prolongs the lifespan of your boots. When you’re done, you should store your shoes for rain in a dry place and away from a heat source, so they don’t get damaged before the next use. A reliable pair of rain boots is something most of us need at some point. Buying them is a smart investment, and it all revolves around what you need them for and how you plan to use them. 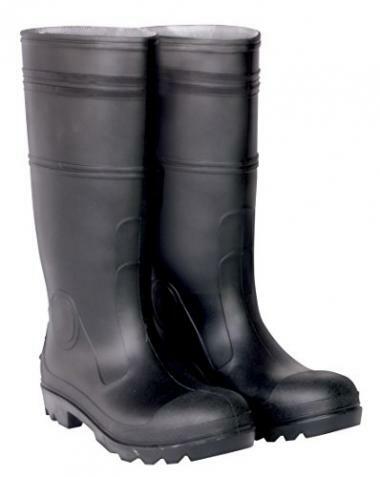 We hope the pointers we discussed help you in finding the best rain boots so that you can always keep water outside. We’re sure you’ll start to love them them as soon as you experience all the benefits they can give you. 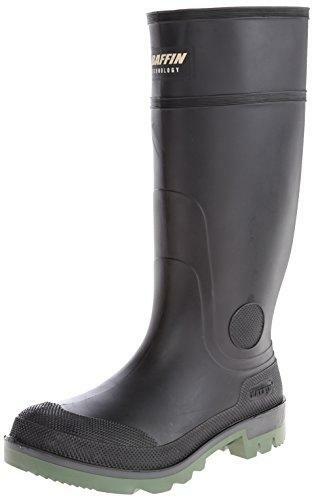 Have you tried a pair of rain boots that made it onto our list? Are they reliable in keeping you dry? How comfortable are they? What about durability and quality? Please share your experience with us in the comment section below.